Despite being a plantaholic, the existence of certain plants eludes me. Then, all of a sudden, a ‘new’ discovery will burst onto the scene, reminding me of the woefully limited extent of my knowledge. Iris bucharica is one such plant, never seen before and yet everywhere at Great Dixter’s Spring Plant Fair. It strikes me immediately as a plant well worth getting to know. Originating from the rocky slopes of north-eastern Afghanistan, Tajikistan and Uzbekistan, Iris bucharica grows from bulbs with fleshy roots rather than rhizomes. Plants have deeply channelled leaves set alternately either side of a central stem, and produce a yellow and white flower from each leaf axil. Anyone who grows sweet corn will be struck by a passing resemblance to that food crop. A Juno iris, Iris bucharica shares the same botanical traits as Iris orchioides (probably a variant of I. bucharica with deeper yellow flowers), Iris magnifica (pale lilac), Iris aucheri (white, violet or blue) and Iris graeberiana (blue). However it’s the only one of the group considered ‘easy’ to grow in the right conditions. 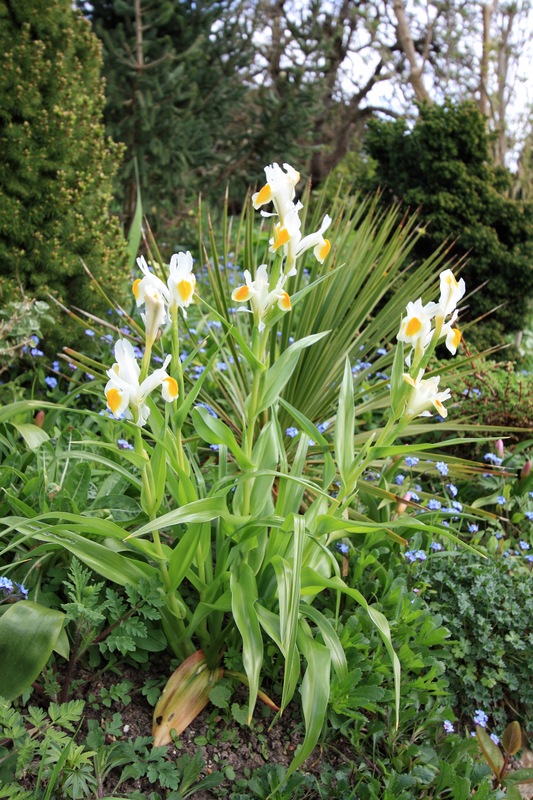 Iris bucharica needs free draining, fertile soil which is neutral or slightly alkaline, full sun and a dry summer spell. The bulbs will do nicely in a deep pot, planted in a mix of John Innes No.2 and coarse grit. After flowering in April, the pot can be placed in a dry, sunny spot at the foot of a wall or hedge for the foliage to die back, which it will by the end of June. If happy, the bulbs will multiply rapidly and can be divided every three or four years if needed. Do this as soon as foliage withers, or plant new bulbs in August or September. 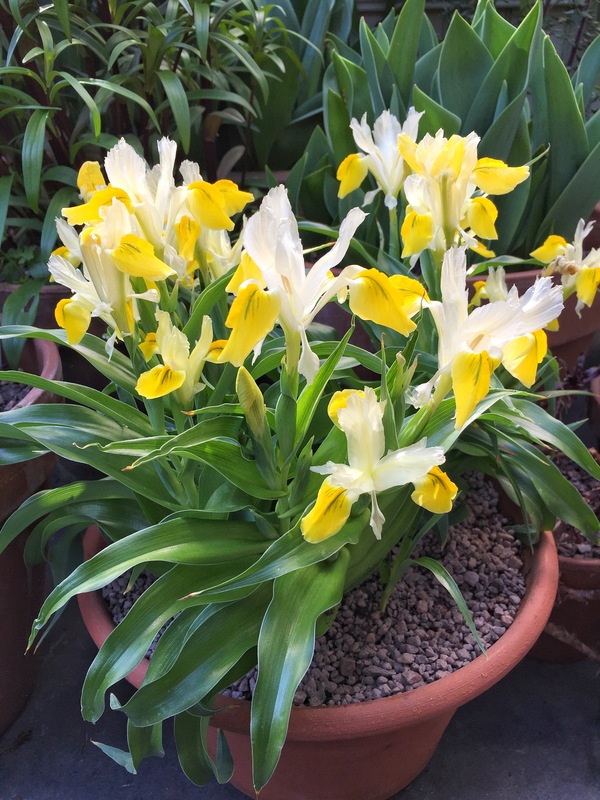 I have planted my Iris bucharica in a pot of gritty loam and placed them at the front of my spring bulb theatre, where they are picking up the colours of Narcissi such as ‘Winter Waltz’. A named variety, Iris bucharica ‘Princess’, is similar in appearance to the species but has freesia-scented flowers. Well worth seeking out for a warm, dry spot where other plants will not cast too much shade. Love that egg-yoke yellow! Gorgeous foliage too. The foliage has a wonderful silvery sheen to it, which makes it gleam in the sunshine. Lovely. Yes, Dan, the ROSARIUM is truly superb and most fortunately comes into its best around my birthday June 15th. We have 25 000 Roses here, 900 different varieties, all organicly cared for. They lay out is one of an English garden. I love the juno irises as well. Here in drier East Anglia I find the various forms of iris magnifica just as easy as bucharica, it may be worth a try. They do well in the garden in a sunny well drained spot and increase quickly.There are several colour forms. I once grew a stunning ice blue. Irises are a slippery slope of plant lust! After junos the oncocyclus group are the ones to watch. Such beautiful muted colours. Huge flowers from unfeasibly small plants. Sadly none can be grown outside in the UK. You need an alpine house. For other growable junos look for graeberiana, both the yellow and blue form. Easy outside. Aucheri is also hardy and has several colour forms.